November 14, 2016, New Delhi, India: As citizens shared their experiences with banks and ATMS and running out of cash in various circles from across India, LocalCircles conducted polls to understand the magntitude of the problem in withdrawing cash from ATMs and exchanging old 500 and 100 notes at the bank. 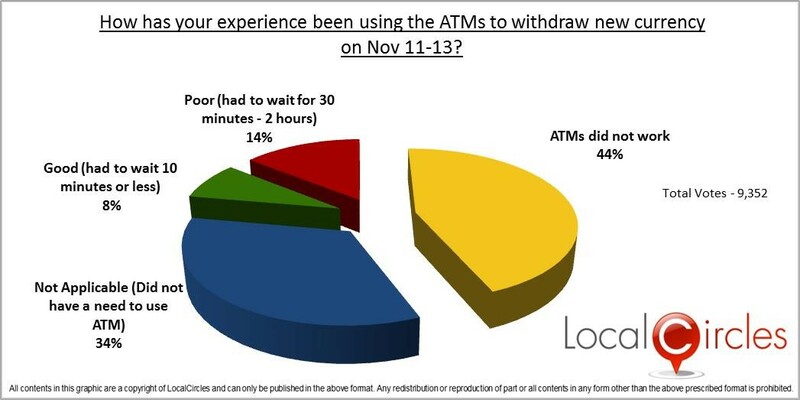 44% of the citizens highlighted that the ATMs did not work between November 11-13, 14% said they had to wait upto 2 hours, 8% suggested being able to get cash in less than 10 minutes while 34% did not visit the ATM. Similarly, at the banks, 29% people said they had to wait over 2 hours to exchange their old currency, 21% waited between 30 minutes to 2 hours, 11% suggested being able to transact in 10 minutes or less while 39% did not visit the bank for currency exchange. This survey highlights the reality of how things are at an aggregate level beyond the individual experiences. 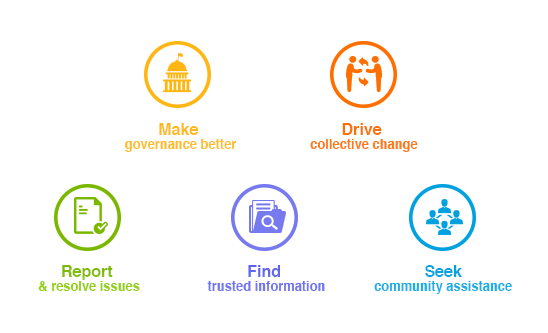 Localcircles, the citizen engagement platform was also the one that ran the poll on currency discontinuation from Oct 31st-Nov 8th . 78% citizens had indicated they supported the discontinuation and color change of 500 and 1000 rupee notes in this poll. The Prime Minister announced the demoentisation scheme on Nov 8th via an address to the nation. In addition to sharing their experiences with the ATM and banks, citizens also highlighted the negative impacts of the demonetisation program and the process gaps they have observed. The key gaps highlighted have been not enough currency being made available in smaller denominations before rolling out the scheme. Citizens have highlighted that since the introduction of 2000 note was already announced, easily over the last month, ATMs could have been upgraded to dispense the same while maintaining secrecy. Also according to citizens, essentials services like private pharmacy, hospitals should have been instructed to accept 500/1000 notes as many patients and their families got stranded while taking treatment. Citizens are also repeatedly sharing various loop holes in the scheme. It is being reported that people with black money are employing poor people with some identification including their workers to convert black money into white. Per field experiences of LocalCircles members, 40% plus people in bank lines are standing for someone else. In addition to this people are paying up to one year salary in advance to their employees in black money. Since 80% of the currency was in 500 and 1000 notes, business owners and citizens are finding foot falls reduced by 50% in malls, local markets etc. and majority expect this to continue in the coming months.